I could have promised my daughter anything — a pony, a princess, a rainbow in a bottle — but instead, I’d promised her something equally unattainable: my bravery. 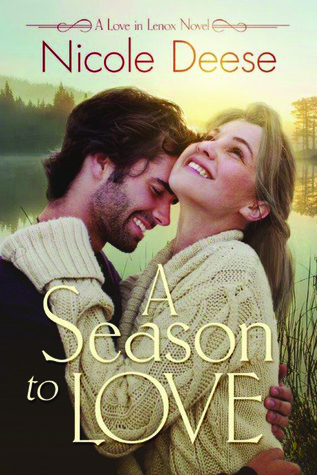 A Season to Love is the second book in Nicole Deese’s Love in Lenox series. The first book in the series is A Cliche Christmas, and I highly recommend it. Click here to read my review for that book. So far, this series is amazing. The characters are well written and the story lines have good depth and are engaging. In A Season to Love, the main character is Willa. Willa lost the love of her life, her husband Chad, seven years ago to an aneurysm. She happened to be newly pregnant at the time with their soon-to-be-daughter, Savannah. And, when Savannah was five, she got sick…really, really sick. This first line illustrates a woman’s vulnerability. She wants to be brave for her daughter, but how does a woman do that when her whole world has fallen apart multiple times? I’m already into chapter 9 of this book and I can barely put it down. It is so good! I highly recommend both this book and book 1. If you are looking for something fast-paced, engaging, and endearing to read this weekend, I recommend A Cliche Christmas and A Season to Love. And, the novella you shared sounds good. I will have to check it out. Thanks so much for sharing. Have a great weekend! I really loved this novella! Thank you for sharing, Debra. That sounds so very sweet! I will have to look this book up (series). It’s a great series so far! I loved Hometown Girl!!! I hope you enjoy it. I haven’t read anything by Lynn Austin yet. I will have to change that because I’ve heard only good things about her books. Thank you for sharing!!! Ohhh! I have to find this series!! Oh dear, my #TBR just grew again! 🙂 This sounds like such a great book! Thank you for sharing it today! Yes, I really am! I stayed up till almost midnight last night reading it. I kept saying, just one more chapter…. I’m looking forward to reading Nicole’s book this next month. Happy Friday! My first line is from Would-be Mistletoe Wife by Christine Johnson. I’ve not yet read Nicole’s books. I’ve read all of his books. They are all so amazing. Love the line. Happy New Year! I really like that first line. Beautiful! The book I’m featuring this week is A Cowboy Unmatched by Karen Witemeyer, who I always enjoy. This is part of an enjoyable Archer Brothers series. I need to check that out. My first line is from Jaime Jo Wright’s The House on Foster Hill: Death had a way of creeping up on a soul, and Ivy Thorpe was determined that when it visited her, she would not be surprised.